There are really only two ways you can go with a hockey logo. You can try for a classic look, which usually means something simple and neutral, like a crest, a letter or a script. Or you can go for intimidating, which usually means a somewhat sinister-looking depiction of the animal of creature from which the team takes its nickname. The intimidating logos can make your team look tough, which is all well and good in a sport that celebrates toughness, but when you make the choice to sport an intimidating style of logo, you have to be careful with the design. It can go from tough-looking to creepy-looking. That's a problem in every league from the NHL to Britain's EIHL. 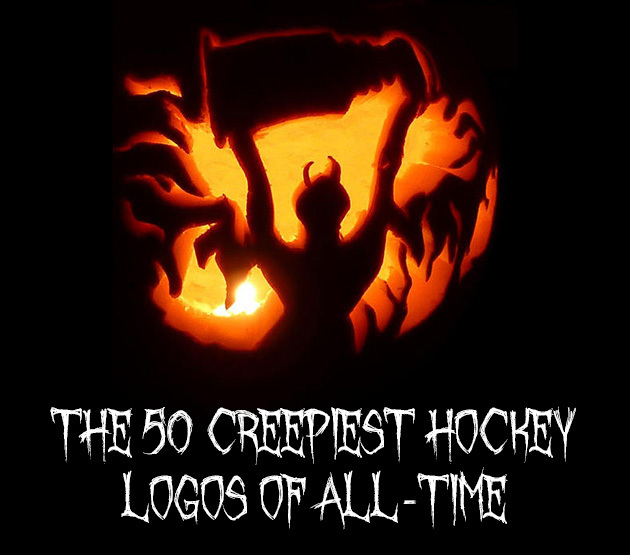 With Halloween just a few days away, and now being the perfect time to appreciate all things spooky, creepy, and spine-tingling, we present to you our list of the 50 creepiest hockey logos of all-time. Lots of hockey logos are just a cartoon animal brandishing or breaking a hockey stick. That can work. It totally doesn't with the Adirondack Icehawks of the old United Hockey League and their bird, which is clearly on some sort of drug-fueled bender. Get it away from the hockey equipment until it comes down. The Aeros are no more, having been transformed into the Iowa Wild. But maybe it's for the best, since it means the retirement of their strange plane-with-teeth logo that, for whatever reason, looks a little uncomfortable to have flown through that puck. It always made me feel weird. Bad logo idea: a giant, hairy tarantula cartoon, with uncomfortably realistic hair. Hey look, it's already been done. Yep, just as bad as I imagined. 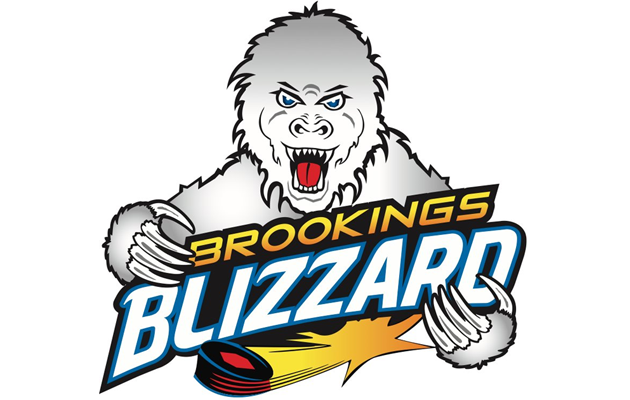 This team only lasted one year in the Central Hockey League, and I suspect it's because they couldn't sell a single t-shirt. It's not even that the Warriors' logo is a skull and crossbones, with bright red glowing eyes. It's that the teeth appear to be flapping in the breeze. Teeth aren't supposed to do that and it creeps me out. The fact that somebody thought this team name was a good idea is creepy enough. But the logo gives me the willies. This is the face of a murderer. Why would you let him represent you? I thought it wasn't that scary a monster, and then I looked and saw that it had Freddy Krueger arms. I also swear I saw this thing move. This was Atlant's secondary logo for a few years, and then I think someone realized that a wild dog baring blood-stained teeth isn't exactly a family-friendly look. Logo tip: no blood. If the Minnesota Magician came to your house, you would scream. He's not the cool kind of dinner theatre magician -- he does dark arts and whatnot. I want no part in it. The Wolf Pack sported this logo on their third jerseys in the 2009/10 season, and it weirds me right out. It's a wolf, but it appears to have a piggish snout and a more anthropomorphic look. I think the Wolf Pack needs to face facts: for one season, they wore a manbearpig logo. I know he's a cartoon, but this rendering of the Ogopogo (a sea monster said to live in Lake Okanagan, near Kelowna) is really, really upsetting to me. Every time I see that smile I have to look away and take deep breaths. The rat is winking at you. THE RAT IS WINKING AT YOU. 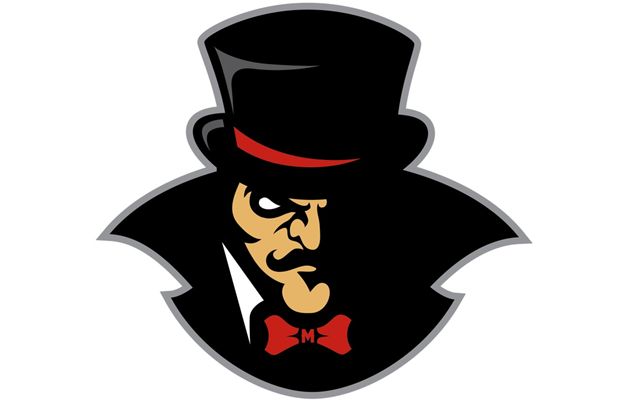 I sort of thought the MAINEIacs had the logo that looked the most like someone that would come to your house and cook you in it, but Braehead in the British league might take the lead in that category. It's the teeth. Next time give them normal teeth. The Roller Hockey International League didn't last long, and I always suspected it's because every logo was terrible, and most were the creepy sort. Case in point this Cheetahs logo, where the cheetah is way too realistic and has bright red glowing eyes. Looking for a cool yeti photo, the Blizzard turned up a scary death-yeti. Not optimal. Tip for the Cottonmouths, or any sports team: don't make your logo a terrifying snake head that nobody will ever want to look at. It's that stinger, man. Did it really need a red tip? I submit that no, it did not. Get it out of here. Lots of different ways to do a predator -- I'm sorry, Predateur. Not sure you had to make it some sort of ravenous fish demon. And is that a tongue, or is there loose flesh hanging from the left side of his mouth? That had better not be loose flesh. Maybe it's blasphemy to say so, but this alternate logo, used from the sixties to the nineties, has always been way creepy to me. It looks like something your kid would draw on a wall, although if the kid actually did, he'd be seeing a therapist late that day. Ugh, those eyes. Bright red with a thin yellow line for some reason. They give me the shivers. I guess it doesn't help that this is some kind of demon. What it has to do with Force, by the way, is beyond me. At first glance, it's just an ordinary tiger. Then you realize it's missing an eye. Sure, maybe that's just indicative of the spotty medical system of the 1920s, when the Tigers played, but I'm not so into Ti-clops. Maybe I didn't make myself clear earlier. No snakes. And definitely not this crudely-sketched monstrosity, with its flickering tongue, huge fangs, and "COBRAS" tattoo. Somehow, this one manages to be both ridiculous and scary. An evil Christmas tree is your logo? Really? I don't like it, and I don't like looking at it. Feast your eyes on the scariest Pez dispenser in hockey history. Craziest part: I'm pretty sure that's actually what this is supposed to be. NO SNAKES. And I definitely don't have time for a terrifying snake with a sexually suggestive mouth. Did no one tell the Rattlers it looks like lady parts in the snake's mouth? Crudely sketched. Way too dark. Asymmetrical eyes. Nightmare fuel.